A General Session or Keynote Session is generally a conference or conventions headline act. A greater level of service and presentation is needed to showcase your special event. 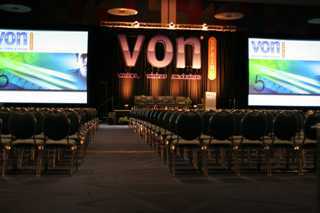 Corporate AV, LLC can help you achieve the grand look to wow your attendees and keep them coming back for more. Set Design: A boring ballroom and a set to wow your attendees might be the key to keep them coming back year after year. Talk with our team and see what we can do to design something special just for you.